There are certain places in the world that no matter how good cameras get, they will no be able to capture the beauty of the scene. La Sainte-Chapelle is one of those places. The chapel is located on Ile de la Cite and was the royal chapel for King Louis IX. The chapel is considered among the greatest Gothic architectures. Every time I have visited the La Sainte-Chapelle, some part of it has been under restoration; therefore, a photo of the entire chapel would include some not-so-picturesque scaffolding. In addition, the chapel is dark but because light streaming through the stained glass windows has a high dynamic range of light—again complicating the photo taking process. My Paris trip allowed me to use my Nikon D800 much more than I have ever used it. I was quite surprised and happy with two elements of the camera: (1) its ability to produce clean photos at much higher ISOs than the Nikon D3x; and (2) a very large dynamic range of the sensor—overall, probably a stop or two more than the Nikon D3. My post processing included some work in Photoshop CS5 because I wanted to bring out the details and Lighroom would did not produce the results that I wanted. Camera settings: Nikon D800, 28-300mm f/3.5~5.6 at 28mm, ISO 2500, f/3.5 at 1/15th of a second (braced against some scaffolding). Lightroom 4—applied Standard preset during import, set white and black points, increased shadows and decreased highlights and added vibrance and clarity. Photoshop CS5—applied nik Color Efex Pro Detail Extractor and Tonal Contrast filters and sharpened photo using high pass filter method with blending mode set to overlay. 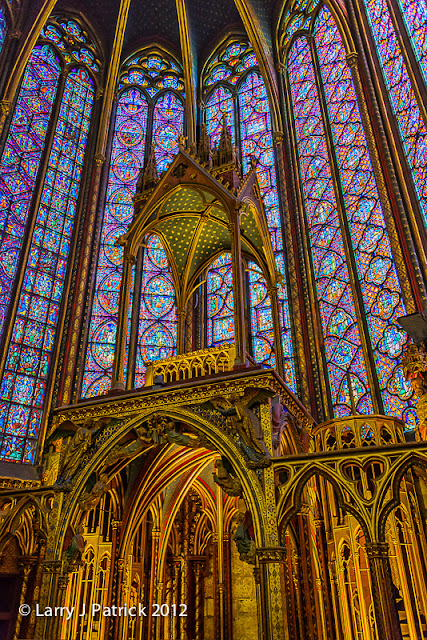 I have seen many photos of Sainte Chapelle but this is one of best. Love the details. Like Debbie, I have seen a lot of photos of Sainte Chapelle and have visited it twice. This photo does justice to Sainte Chapelle. Enough said.